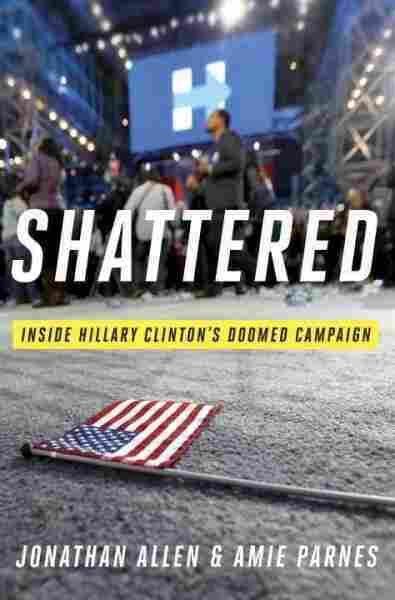 'Shattered' Picks Through The Broken Pieces Of Hillary Clinton's Dream A new book goes behind the scenes of Clinton's presidential bid. "There is no Big Reveal," says NPR's Ron Elving. "Instead we get a slow-building case against [her campaign's] concept and execution." Democratic presidential candidate Hillary Clinton speaks during a campaign rally in Raleigh, N.C., on Nov. 8, 2016. Ever since election night last November, millions in America and around the world have wondered what happened to Hillary Clinton, who was widely expected to become the first female president of the United States. In fact, nearly everyone in the business of politics thought she would win, including many of Trump's own people. So how did she lose? 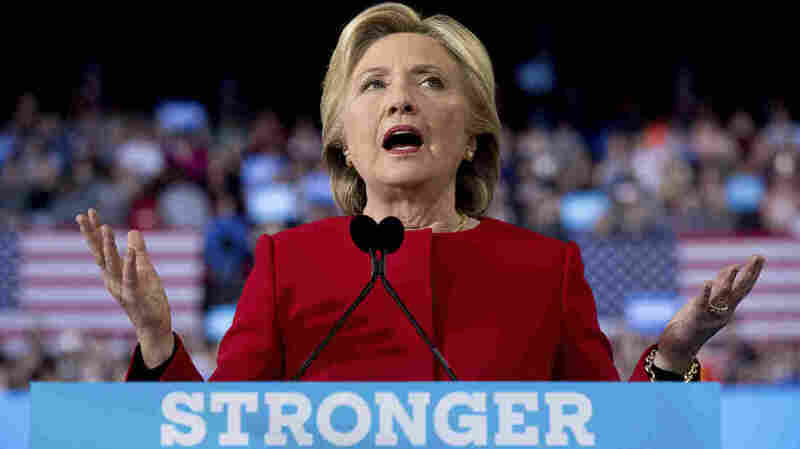 Providing that answer is the mission accepted by Jonathan Allen and Amie Parnes in Shattered: Inside Hillary Clinton's Doomed Campaign. It is by no means the last word on 2016, but Allen and Parnes must be regarded as early front-runners in the race to make sense of it all. They saw and heard far more than most of us, exploring deep inside "Clintonworld" in search of the real story. And in these pages, they share enough of what they witnessed to enable us to reach our own conclusions. Far from a juggernaut, the campaign we see in these pages is plagued with division, unease and anxiety practically from the outset. When things go right, it only means they are soon to go terribly wrong. Win a primary, lose a caucus. Quash a rumor, see three more go viral. Close one wound and find another torn open again. Among those wounds, the first cut is the deepest. The email stories that began in March 2015 never go away. First, it's Clinton's own private server, then the hacking of the Democratic National Committee and the endless email dump stolen from campaign chairman John Podesta. Email becomes the cyber-incubus the campaign cannot shed. Whether anyone with Trump connections was colluding or complicit in the WikiLeaks-Russian caper or not, the continual media focus on email issues could scarcely have been more convenient for the Trump campaign. The authors also see lasting damage inflicted by her Democratic-primary rival Bernie Sanders' challenge from the left. Sanders' rather quixotic campaign not only tested Clinton, it played perfectly into Trump's own critique of "crooked Hillary" and his tactic of tying her to globalism and Wall Street. "For both sides, Hillary was the perfect symbol of everything that was wrong with America," the authors conclude. "At times, Trump and Sanders would act as the right and left speakers of a stereo blaring a chorus on repeat: Hillary's a corrupt insider who has helped rig the political and economic systems in favor of the powerful." But in the end, Allen and Parnes contend, the worst blows Clinton suffered were self-inflicted. If the controversies and corruption memes came to define her, they write, it was largely because she never managed to define herself. Clinton kept questioning her staff why she was losing working-class whites, her most loyal voters in 2008. "Why aren't they with me?" she asked during the 2016 primaries. "Why can't we bring them on board?' "
Such uncertainty is a recurring theme. The book begins with Clinton searching for the right notes for her announcement speech, and it ends as she wrestles with a concession speech she never expected to give. In fact, the book often dwells on her problematic speech prep. All major politicians have ghostwriters, but Clinton had panels of them. Writers, consultants, script doctors and kibitzers crawl over every page and paragraph of her scripts — sometimes until just minutes before delivery. Where exactly is the candidate herself in all this messaging mélange? Does she have something she really wants to say? Everyone agrees she has plans for every policy problem in the world, but voters want to know what's inside you. And they also want to know what's in it for them. The tone of the Allen-Parnes narrative is unsparing but not unsympathetic, noting campaign flaws and missteps without rue or recrimination. Having collaborated on a book-length profile of Clinton in 2014, the authors extended their research and sources for this insider account. We can readily imagine them setting out to write a very different book about the first female president. Instead, the authors often seem to be shaking their heads at the unforced errors, internal squabbles and media scrutiny that did in that dream. "Hillary distributed power so broadly that none of her aides or advisors had control of the whole apparatus," they write. We learn that campaign manager Robby Mook, the wunderkind whose heart belongs to data, pushes voter modeling and analytics and models, while pinching pennies on everything else. He clashes with more senior aides who want to invest in more conventional polling, field organizers and yard signs. He also crosses swords with campaign chairman John Podesta, who is twice his age and steeped in official Washington, an intimate adviser to both Clintons and President Barack Obama. We also feel the widely shared exasperation with Huma Abedin, Hillary Clinton's longtime confidante. Abedin shields her boss from campaign stress, but also reinforces her penchant for privacy. The mystery of Abedin represents what is remote about Clinton herself. This volume may not belong on the same shelf with the series of Theodore H. White classics (The Making of the President) from decades ago, or the quadrennial volumes by reporters Jules Witcover and Jack Germond, or the novelistic What It Takes by Richard Ben Cramer. But Allen and Parnes offer a first bridge beyond the journalism of the campaign year to the scholarship of the historians and other scholars who will process all this material for generations to come. Clinton could hold on to enough of the contemporary Democratic Party to beat back Sanders and win the popular vote in November. But she had no answer to the populist appeal Trump enjoyed among white males and noncollege working people in general. Her extraordinary career prepared her to be president, but not to understand ordinary Americans. Ultimately, Allen and Parnes get inside the campaign but not inside the mind of Hillary Clinton. Much the same seems to have been true for most of her staff and, ultimately, the voters. Maybe we never really know the person we send to the White House, but we usually think we do. With Clinton, we never quite got there.